Italy is not only worldwide famous for pasta and pizza but especially for its delicious desserts. Join this tour and taste them all! Since Ancient Roman times Italians have considered desserts an important part of their cuisine keeping creating new ones and perfectionating the olds. On this tour you will make a sweet trip through history and cakes. CAKES AND PASTRIES FROM ANCIENT ROME UNTIL TODAY! Italians have always had a very big sweet tooth:-) In Ancient Rome they mosty used honey and cheese to prepare their cakes, often served with wine at the end of their banquet. They used to call desserts Secundae Mensae. Sugar was unknown until the Crusades and it is only at the end of the Middle Ages and after the discovery of the New World that will beused more and more in pastries preparations. In more recent times new desserts were created and became very famous such as Tiramisù and Zuppa Inglese. The mix of cheese such as Mascarpone, coffee, liqueurs and other local ingredients gave this cakes a special flavour and worldwide fame. 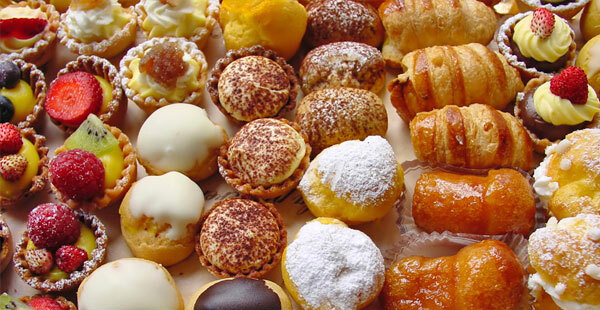 On this tour you will taste a large variety of Italian cakes and pastries in many different typical shops where you will have the chance to meet and talk to the artisans. Between the food stops our guide will show you some of the most beautiful and interesting sites in downtown Rome blending art, history and cuisine. This is our special recipe: eat, drink and sightseeing for a memorable experience. You will taste and learn about Cannoli, Diplomatici, Babà, Cassate, Brutti ma Buoni, Zabaione, Sfogliatelle and other great pastries and cakes as well as a real genuine traditional gelato. This is not a tour for people on a diet, but it is a fun feast for the palate! For information and reservations please contact info@foodtoursofrome.com. For our first full day in Italy of our 2 week trip, we decided to take this tour based on Trip Advisor review. It was AWESOME! We had Bruno as our guide and were with a wonderful friendly group. It was so much more than a food tour... Bruno shared history, funny stories, current events in Rome and his opinion as a local. He fed us good food and took us to wonderful family-owned businesses. Our tour lasted well into 5 hours just because we asked so many questions and didn't want to stop. Come with an empty stomach and be prepared to be full. But the variety of flavors is wonderful. I would do this tour again in a heartbeat. By far, the best thing we did with our limited time in Rome. Gratzia Bruno! We took this tour with Bruno on our first night in Rome -- we were tired from the traveling but were so pleased that we didn't give in to exhaustion and went ahead and took the tour. It was an excellent chance to walk through the neighborhoods, taste some classic Italian food -- from things that are well known to the rest of the world, like cannoli, to things that are not quite so familiar, like fried artichokes. Bruno was lovely and he shared lots of interesting information, about Italian food, Italian culture, and history. The portions were sensible, so by the end of the night, you felt more than satisfied but not uncomfortably full. We did one other food tour, which we also enjoyed, but this one was the best in terms of the history provided and the quality of the food. We went back to several of the places on the tour and would have been happy going back to all of them. In short, this tour is highly recommended! we went on the evening tour with Marta. She was fantastic. We were introduced to loads of different types of italian food, wines and beers at 7 different outlets in the various areas of rome. Most of the food was very different to other restaurants I had tried in rome previously. Marta explained all the dishes, the area it was from in Italy and what made the venue and the food we were trying special. You even get a walking tour of parts of rome to go along with it. By the end of the tour we were definitely full (even though we skipped both lunch and breakfast) and rolled away from the tour very happy! Cant recommend this tour enough, do it early in your visit to Rome and you can take advantage of the supplied list of restaurants or a return visit to some of the places for a second helping! PRICE Contact us for a quick quote. Discounts for children and large groups. Contact us for more details about this tour and if you have special wishes or needs we can customize the itinerary. Planning well in advance can save you time and money! 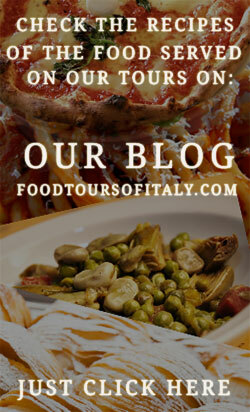 Our food tours are among the top attractions is Rome and all the spots get filled up early. © 2018 Food Tours of Rome. All Rights Reserved.